Welcome to the fun, affordable photo booth or photobooth for your next wedding or party! Fun Photo Booth for your wedding, event or party! The photo booth will be assembled and removed at the designated time. This time does not include setup and removal, the booth will be available from the start time to the end time. There is no work on your part! With Clayton's Photo Booth, a tacky unrefined Photo booth is a thing of the past. Clayton's photo booth is classy with the full booth having a red curtain that seems to blend into the room, yet gently invites guests in to take photo memories. When you decide on a photo booth for your party, wedding, event or more; consider Clayton's Photo Booth, located in Sheboygan and serving the entire state of Wisconsin. Clayton's Photo Booth is fully automated and guests can simply enter, press the start button, the booth counts down and takes the pictures - then prints them out! The photo booth then automatically takes 4 pictures 4 seconds apart or 3 pictures 4 seconds apart (if you desire to have a logo designed by us or you). Please find all of our options, prices and much more on the contact page for prices. Photo Booth for your upcoming wedding or event! Events have never been more fun! Print a slide show of your fun at the wedding! Birthday parties, or other gatherings will have you remembering the fun for years to come! 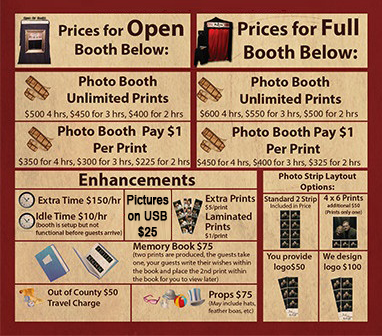 With prices much less than other photo booths, anyone can afford to have a Clayton's Photo Booth at their event! 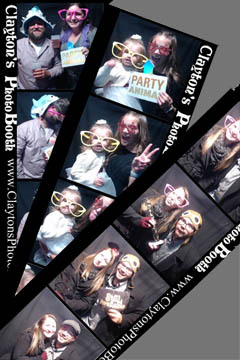 Clayton's Photo Booth is fun for everyone, take fun pictures with friends and family! A photo booth to remember the event or wedding will have guests talking for years! Clayton's Photo Booth is not your average tacky mall photo booth where guests are crammed into a small space, usually only meant for one person. Clayton's Photo Booth offers a spacious area with enough room to fit up to 4 people! The completely automated system will start taking pictures of your guests with 3 second intervals. In less than one minute guests will have photo booth pictures in hand and remember your event for years! After pressing the start button, the photo taking process is completely automatic and in less than a minute after exiting Clayton's Photo Booth at your wedding, party, event and more, prints are printed. 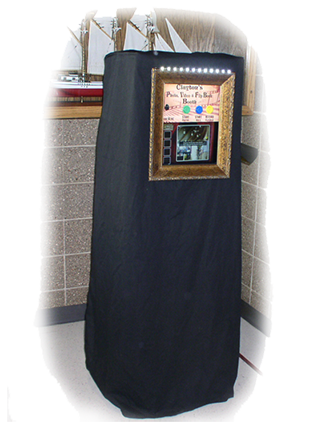 You have a choice between two styles of photo booths to for your event, party, wedding, or graduation. The full booth is the most preferred photo booth for weddings, parties, graduations, gatherings, and other events. 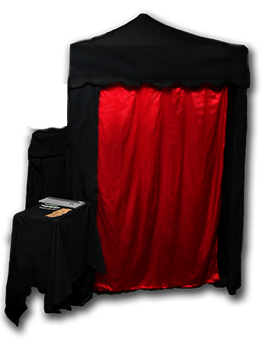 The full photo booth is a full tent enclosure with red curtain that your guests close and have privacy while taking fun pictures. You can choose to have props available with the photo booth. Clayton's Photo booth for your next party or wedding!